I.E. Repin State Academic Institute for Painting, Sculpture and Architecture in St. Petersburg will open its doors to hold the International Exhibition of Calligraphy from September 16th – 21st, 2008. As a part of the exhibition programme, masterpieces of Arabic calligraphy are to be revealed. According to information posted on the official website of the project, it will be the world's first large-scale exhibition of works executed by the best calligraphers all over the world including Russian artists. Among the participants are representatives of calligraphy schools from Europe, the Middle East and the Far East, America and Australia. MVK, the International Exhibition Company and the National Union of Calligraphers are the official organizers of the exhibition. The exposition will include over 120 artworks placed on an area of ​​over nine hundred square meters. A wide-range exhibition of the most interesting and unexplored samples of Slavic writing, historical manuscripts and manuscripts of the nations of the world, which are stored in local archives, in the Russian State Library and the National Library of Russia. A great gallery of rare, scarce and unseen manuscripts and miniature books from private collections will be presented. Besides these, visitors will see writing materials and utensils of all ages, and will be able to scrupulously examine modern originals and distinct samples of applied calligraphy (embroidery and engraving) and specialized books. The exhibition will feature round table discussions, seminars, lectures and lessons for kids and adults. Works representing Arabic calligraphy which are executed by artists from Syria, Palestine, Turkey, Russia and Ukraine will take the main part of the exhibition. In particular, visitors will be able to see the Tugras and Shamaili executed by Nazip Ismagilov, a famous Tatar calligrapher, member of the National Union of Calligraphers. In addition to the presentation of his artworks the calligrapher is to deliver a lecture as a part of the event, which is called “The Genre of Tugra in Tatar Art of Calligraphy. 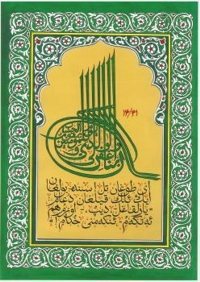 A brief history on the Tatar’s art of calligraphy that lived in Volga region at the beginning of 20th -21st centuries. 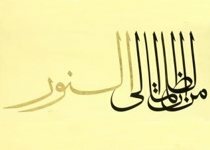 Arabic calligraphy (handwriting: “Naskh” – a “copy” and “Suls” which means “one third”) executed with a lettering pen and ink. “Just like all European science will always use Latin, so the Arabic script for us will always remain the way to understand Islam, our historical and cultural heritage will remain one of the kinds of contemporary art. I love handwriting. It opens up unlimited opportunities to create the beautiful,” the official website of the International Exhibition of Calligraphy reports quoting Nazip Ismagilov. Jordan Nassar Mansour, professor of the Art of Arabic Calligraphy at Al-Balqa Applied University, participant of numerous exhibitions of the Middle East, Europe, India, Malaysia and Japan deserves special attention among foreign calligraphy masters who will have their masterpieces exhibited in Saint Petersburg. 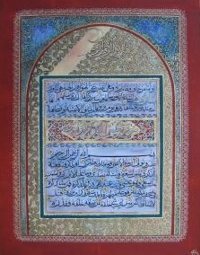 Nassar Mansour is one of the most accomplished contemporary calligraphers in the Arab world. He was engaged in the twelfth-century Saladin′s pulpit’s (minbar) inscriptions and ornaments restoration, which had been destroyed in 1969, at the al-Aqsa Mosque, Jerusalem. Everyone who visits the exhibition unfolded in I.E. Repin State Academic Institute of Painting, Sculpture, and Architecture of St. Petersburg will have a great opportunity to meet with the master at lectures and master classes, which he plans to give on September 20th. There some other artworks presented at the exhibition that will undoubtedly attract the visitors’ attention: by Hasan Abu Afash, a calligrapher from Gaza, Palestine; by Aleksei Chekal, a calligrapher artist from Ukraine; Valentina Kozhevina, a calligrapher from St. Petersburg, Russia. Their masterpieces are executed with a certain flavour of Islamic motives. Hasan Abu Afash. There is no god but God, Muhammad is the messenger of God. Nazip Ismagilov. Shamail: O Lord, forgive and bless me!